*No maple syrup on hand? Go ahead and sub with agave, or corn syrup! Line a rimmed baking sheet with parchment or aluminum foil. In a small bowl, mix together oil, maple syrup, herbs, and spices. In a mixing bowl, add all of the nuts. 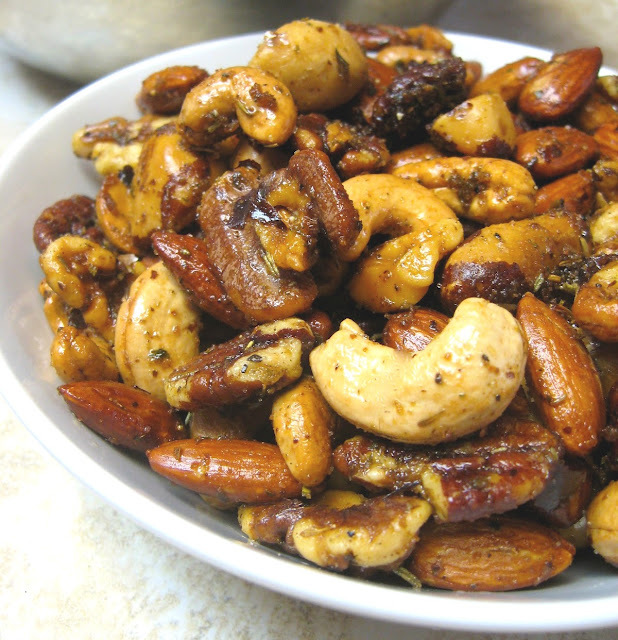 Toss nuts with herb mixture to coat completely. Arrange in a single layer on the baking sheet. Rinse and dry mixing bowl. Bake for 30 minutes, turning every 7 or 8 minutes. Remove from oven, return to mixing bowl. Add salt and pepper and toss to coat and cool. Package in an airtight container or sealed bag. These last about 2 weeks in an airtight container.